Caviar is one of the world's most expensive food item, coming from fish called sturgeon and having a rating and classification system that can seem complex to the unfamiliar. Most of the world's caviar comes from three main species of sturgeon that live in the Caspian Sea – beluga, ossetra and sevruga. However, there are more than just these three species of sturgeon fishes around the world, also contributing to the world's supply of true black caviar. Side note: caviar cannot be legally called caviar unless it comes from a sturgeon. The crème de la crème of the caviar world, Beluga comes from the largest of the sturgeon species, with the female taking up to 25 years to mature and produce eggs. Beluga caviar varies in colour, from light to dark gray, and is the largest amongst the different types of roes, yielding a rich and creamy taste that's highly prized. Although delicious, the fish that produces this caviar is endangered and fishing restrictions have been put in place. Also spelled Osetra, this species of sturgeon is smaller than the Beluga and therefore produces eggs that range from medium to large size, with a range of colours depending on the variety, going from light to dark brown but sometimes producing golden highlights. Although smaller, Ossetra has a buttery and nutty flavour profile and is firm in texture. Smallest of the main three, the Sevruga species' maturation period is shorter due to its shorter lifespan and is often perceived to provide entry level access to the world of quality caviar. Although the eggs are small, they produce a sweet and rich briny taste with a long finish that lingers on the palate. Pair it with thin crackers and a cheese board and you've got a winning combo. Sourced from a rare albino Iranian beluga aged between 60 to 100 yeard old, Almas (russian for diamond) is the world's most expensive caviar, according to the Guinness World Records. Because of the wisdom that the clearer the caviar the higher the quality, you can understand why these clear golden eggs fetch such a high price, going up to £20,000 per kilo. Oh, and did we mention the 24k gold tin it comes with? 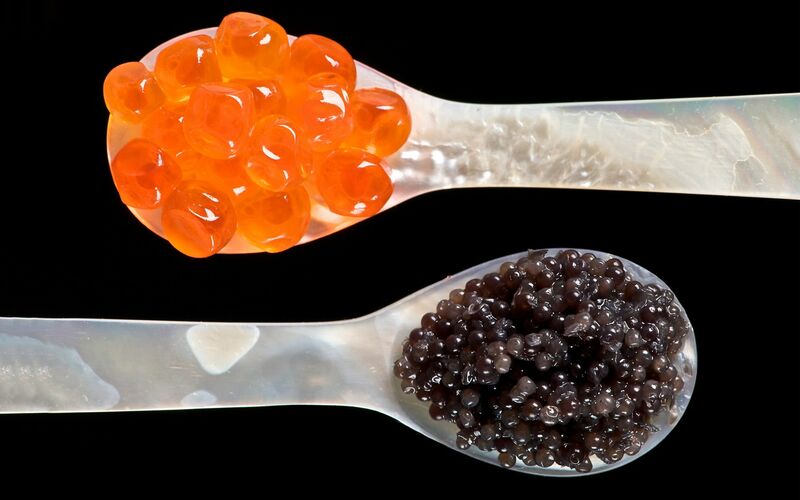 Made from rejected roe that have been deemed unsuitable to be served as a whole grain, this caviar is made through a curing and pressing process that results in a concentrated paste-like spread. Because of its salty qualities, it can be used in a variety of dishes as a substitute for salt, thanks to its intense flavour profile and smooth texture. Remember, anything that doesn't come from a sturgeon isn't actually caviar, but it's still fish roe. And just because it isn't caviar doesn't mean it doesn't taste good. For example, ikura, salmon fish roe, is a go-to for Japanese sushi chefs because of its tasty qualities. So the next time you're shopping for a tin, read the label. Tastemakers Ask A Chef: What Food Will You Never Order?